The Texas women of 1836 unknowingly wrote their own history. Their strength surpassed more than most could ever imagine. This time of the year, the spring, I always think about them. The women who came to Texas were strong beyond means. They faced every hardship and danger that one can imagine and still they survived. The following stories relate the tales of a few of these women. The first is an unnamed woman from Anahuac. The second story will be the tragic story of Susannah Dickinson, who along with her baby Angelina, survived the fall of the Alamo. The third is Mary Millsap, the wife of Isaac Millsap who died March 6, 1836 at the Alamo. My daughter-in-law is of the Millsap family. The families who arrived in Texas as part of Austin’s “Original Three Hundred” found various ways to deal with the hardships of this new land. They even received assistance from the Mexican Comandante at Bexar. Indian attacks kept the people of Gonzales on their toes. 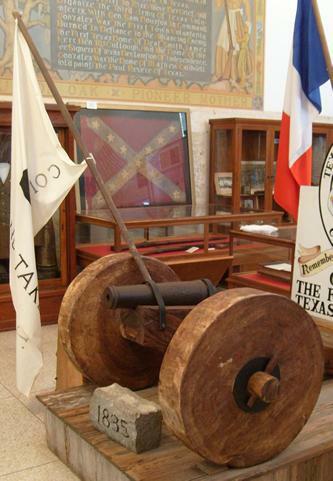 The Mexican government presented the people of Gonzales with a cannon. The gun was almost worthless but the loud noise that it made helped the settlers in defense of the Indians. Most of the Mexican forces found in Texas at this time were presidarios, the worst convicts of Mexico. The Mexican government drafted these convicts into the armies. This posed a problem and may have contributed to the start of the war. The settlers and the presidarios were constantly at odds with each other. The incident at the town of Anahuac is just one example of retaliation against the Mexicans, a retaliation that could have sparked the flame that would later become the full blown fire of independence. The presidario was in a heck of a mess and things were about to get worse. The settlers took tar and coated the man’s entire body. The woman, that he had helped abuse, took the feathers from her bed and covered him with them. The settlers took the tarred and feathered presidario on a little walk through the main street of town and directly to the Mexican garrison with the warning that if anything like this offense happened again that there would not be a presidario left alive. The Mexican Presidarios were not happy with this little incident and their reaction resulted in the arrest of several soon to be heroes, namely one William Travis. One thing led to another. The settlers met and words of revolution began to spread. The Mexicans released the Anglos but the settlers were still not happy and the smoke of revolution began to cloak the horizon. A few years after the incident at Anahuac, Capitan Castenado headed to Gonzales to retrieve the old iron cannon that Mexican government had previously given to the settlers. His orders were to use force if necessary but no matter what to get the cannon. Captain Albert Martin sent messengers to the settlers in the surrounding areas to come to his aid. The fire just got hotter. At this point, the men of Gonzales knew that the feared Mexican forces would be on the move. With this thought in mind, the people of Gonzales began doing what they could to support the upcoming revolution. Settlers donated all their iron. The women brought in their flat irons, pots and pans. One woman even gave the spindle from her spinning wheel. In the midst of preparing to march to San Antonio, the people of Gonzales decided that they needed a flag. An appointed committee designed what they considered a flag of support for the cause. Again the women rallied. The committee took material in the form of the ladies cherished silk dresses. These dresses were in all shades and textures. One woman donated her only set of green window curtains.